Dubai, United Arab Emirates – 19 July, 2018: Huawei Consumer Business Group (CBG), the global smartphone giant, continues to share the UAE’s vision to constantly innovate and provide cutting-edge technology to ease consumers’ daily lives. As one of the top three smartphone companies globally and number one in China, UAE remains a key growth market for Huawei globally. 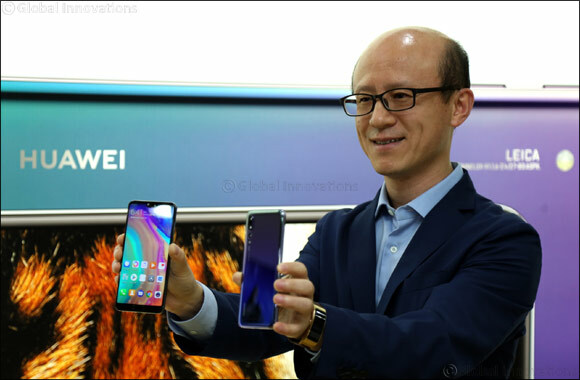 “Huawei CBG has been committed to the UAE and the Middle East for over fifteen years and has shipped over 66 million smartphones to the region. In fact, our success in the region and the UAE specifically, is representative of UAE supporting innovative and successful enterprises from China. We, as a brand, are aligned to the UAE’s national vision for innovation,” said Mr. Gene Jiao, President of Huawei CBG, Middle East & Africa. China is one of the leading innovation hubs in the world and with Huawei CBG marking its number one market share in China and number three worldwide; it clearly mirrors the representation of a successful Chinese enterprise operating globally. The company supports the global workforce by employing over 180,000 people across 170 countries. Moreover, its consistent investment in the UAE, illustrates its commitment to the nation and the region. Huawei was one of the first to partner with Etisalat to launch 3G connectivity in 2003. Huawei is now a pioneer in world’s first end-to-end 5G system. Its network reaches out to 1/3 of the world’s population and has over 340 million phone users and it currently ranks at second position in market share in the Middle East and Africa. In 2017 Huawei climbed up to the 83rd place from the 129th with a revenue of $78.51 billion, making the top global 100 in the Fortune 500 list, which has become an important indicator that renowned companies use to measure their own strengths, size and international competitiveness, a parameter of global economy that transcends beyond borders, nationality and cultural differences. “Our market share in the MEA has increased by 31.25%, this is only an indication of our strong performance this year and our steady growth in the region,” added Jiao. According to the GFK May 2018 report Huawei CBG market share in the Middle East and Africa was 21%, an increase of 31.25% when compared with the brand’s market share in December 2017. In addition, Huawei CBG’s market share in the UAE is at 20%. The company also reported exceptional growth through a rapid increase in smartphone shipments in H1 2018. Huawei is number 79 on the Forbes Most Valuable Brands in the World, representing Chinese innovation, leadership and success globally. “Huawei CBG’s growth is a result of its innovative technology and its dedication to constantly improving the user experiences of its consumers through its outstanding product features,” says Jiao. With consumer centric approach, Huawei leads Artificial Intelligence chipsets in smartphone industry and has launched world’s first processor with built-in AI chipset - Kirin 970 in HUAWEI Mate 10 Series. Company’s another breakthrough product HUAWEI P20 Pro offer world’s first 40 megapixel Leica® triple camera that is enhanced with AI scene recognition to capture perfect images in the night or low light scenarios. HUAWEI P20 Pro is a testament to the brand’s constant mission to achieve excellence with all its products that offers solutions to its customers that bring ease and innovation into their daily lives. “Innovation is at the heart of everything we do at Huawei CBG. Our exceptional features are a result of our heavy investment in research and development. We are the 6th biggest spender in the world in R&D. In fact, last year, we invested more than 12 billion in R&D, which is 14.9% more than other industry leaders” comments Jiao. Huawei continues to deliver breakthrough technologies and set new industry standards in innovation. Huawei is also one of the top spending companies in research and development capabilities, investing a significant amount of its annual sales revenue to R&D efforts, and has established 16 R&D centers, 36 joint innovation centers and 45 training centers around the world. Last year in September, Huawei CBG hosted, “The Future of Innovation” event in Dubai, UAE. It brought together minds from China and top regional companies who explored opportunities for innovative Chinese companies to expand their reach into the growing the Middle East market.